Virat Kohli says Australia must bat without "ego" to stand a chance of winning the Ashes in England this summer. 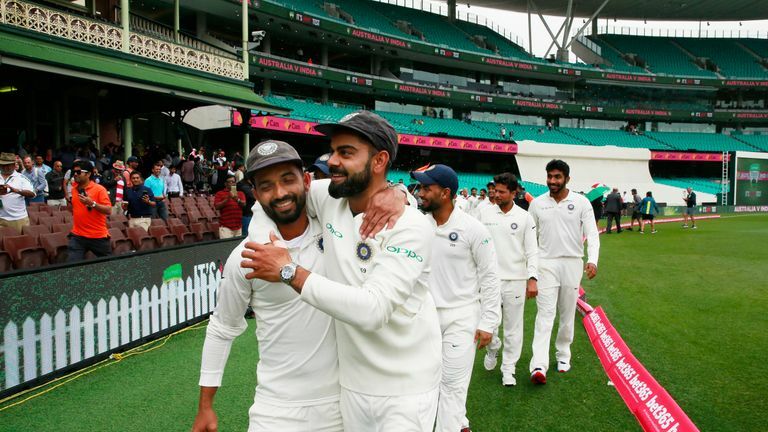 India are toasting their maiden Test series victory in Australia after beating Tim Paine's men 2-1, with Marcus Harris' 79 in the first innings of the final Test in Sydney the hosts' top score in the series. Kohli feels the Baggy Greens - likely to be reinforced by Steve Smith and David Warner in England following the completion of their bans for ball-tampering - must treat the Dukes ball with respect when the Ashes begins at Edgbaston on August 1, live and exclusive on Sky Sports. "If you go out there with an ego, you might as well not go at all," Kohli, whose side were beaten 4-1 in England last summer," told cricket.com.au. "Because that Dukes ball, it buries egos pretty quickly. "You have to curb yourself down and do the hard yards. Grind it out the whole day, you have to be patient as a batsman. "There's a lot of time in Test cricket. But sometimes we are so nervous as batsmen, we don't quite realise it. "You just want to get away quickly but in England you're not allowed to do that. You have to buy your time, earn the right to score runs eventually. "You have to get into a position where you should not even look at the scoreboard to see the number of balls. It's inconsequential. Patience is the only thing that works there." India coach Ravi Shastri also expects the Dukes ball to pose Australia problems - but feels their bowling attack gives them a chance of keeping the urn they regained by beating England 4-0 at home in 2017/18. "I think they'll be up to the challenge," Shastri said of Australia. "I think Australia has to be patient because in England that Dukes ball will curve around corners. You've got to trust your technique, trust that off-stump. It's belief. "[Australia] have the [bowling] attack. If anyone tells me that this Australian attack is not quite there, put your pads on and go and play them, you will find out."